The Center for American Progress published an analysis in June 2013 that detailed a proposal for a massive open-pit mine project that would unearth 12 square miles of pristine Alaska wilderness. 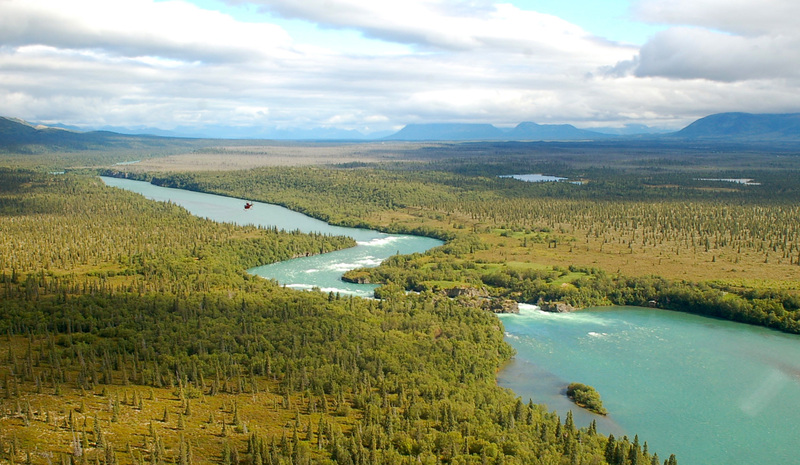 The Pebble Limited Partnership’s mining claim lies in a remote swath of Southwest Alaska between two rivers that collectively produce more than one-quarter of the planet’s sockeye salmon and support a fishery with an approximate annual value of $1.5 billion that provides nearly 10,000 full-time jobs. Our analysis concluded that the known impacts of open-pit copper mining—including digging up the ore, separating it with toxic chemicals, and building extensive new transportation infrastructure—did in fact pose grave risks to the region’s ecosystem and its salmon-based economy. Therefore, we urged the Environmental Protection Agency, or EPA, to complete its scientific watershed assessment of the Bristol Bay region. Once the science was settled, we could make a fully informed determination about whether the project could coexist with this ancient renewable resource. Now, the science is in. Earlier this week—after years of deliberations, more than 1 million individual public comments, and two rounds of independent academic peer review—the EPA released the final version of its watershed assessment, which is based on data provided by the mining company itself. The analysis is clear: An open-pit mine on the massive scale proposed by the Pebble Limited Partnership would pose too great a risk to the Bristol Bay watershed’s salmon resources and ecosystem, both of which are integral to the region’s economy and cultural heritage. The Obama administration must not allow the Pebble Mine project or any other mining operation of its scale and scope to move forward. 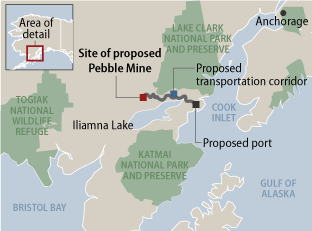 While the Pebble Limited Partnership has yet to file a mine plan that details exactly how it will operate, the company has been clear about fundamental aspects of its proposed operations. There is simply no way it could meet the standards required to protect the watershed. Each of these components of the Pebble Mine project would irrevocably degrade the Bristol Bay watershed. However, it is the concept of overseeing the mine’s byproducts in perpetuity that is of greatest concern. What happens in 20, 30, or 50 years, after half a trillion dollars worth of ore has been extracted and there is no longer any reason for the mine’s operators to stay? As we discussed in our previous report, the United States is already littered with over 500,000 abandoned mines in 32 different states, some of which remain contaminated. When the mining companies vanish into bankruptcy, taxpayers are left on the hook for the management and cleanup of leaky toxic-waste dumps at a cost the EPA has estimated to be roughly $35 billion. 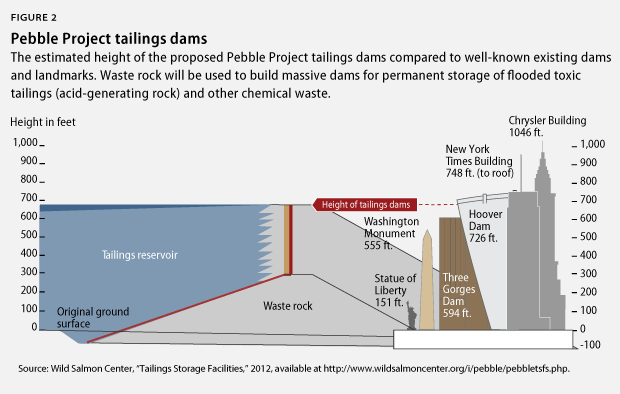 The Pebble Limited Partnership has claimed that even though its deposit lies on a major fault line, modern technology has made the storage of mine tailings safe. As proof, mine proponents point to the earthen dams retaining copper-mine tailings at a project in Chile that survived an 8.8 magnitude earthquake in 2010. While these structures are clearly well designed, how can anyone know if they will hold up a century from now? How can the Pebble Limited Partnership assure us that it will still care enough to monitor them into the future? They cannot even guarantee that the company will exist in years to come. With this week’s release of a final watershed assessment, we now have the requisite science. The risks of permitting this kind of operation in such a remote and unspoiled region are unacceptable. Alaskans and others who depend on salmon for commercial, recreational, or subsistence fishing must not have their livelihoods permanently jeopardized by a comparatively short-term venture. Even in what is typically a pro-development state, recent polling has shown that Alaskans resoundingly oppose this project. A Hays Research Group poll found that nearly 63 percent of Alaskans support a possible ballot initiative that would block the mine, while just 24 percent would back the mining operation. Following the release of the final watershed assessment, there is no longer any question. We must make the choice: Will this region’s future be mining, or will it be salmon? The Obama administration should take Shively’s advice and choose the fish. Michael Conathan is the Director of Ocean Policy at the Center for American Progress. The Center’s Shiva Polefka, Jessica Goad, Matt Lee-Ashley, and Kristan Uhlenbrock contributed to this report.